There's nothing like the aroma of a hot cup of Coffee or delicious espresso drink made from the freshest Coffee beans. Grind your own Coffee beans and experience a flavor revolution at home. There's a reason Coffee shops grind the beans right before preparing your beverage; it just tastes better. Whole Coffee beans have volatile compounds that are released when ground, and the longer ground Coffee is exposed to the air, the more it loses those compounds and aromas. Grinding the beans right before brewing will keep your coffee's rich, full-bodied flavor intact. 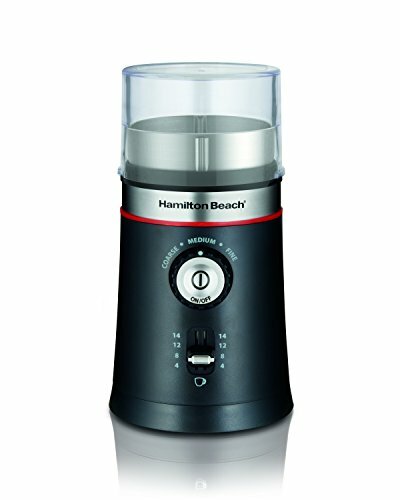 The Hamilton Beach Coffee grinder offers hands-free operation. Add the beans and press the button for true one-touch grinding. Depending on your preference, set the grind fineness to coarse, medium, or fine. Serving a crowd? grind enough beans to make up to 14 Cups of Coffee at once. View More In Coffee Grinders.